After a few months’ hiatus, we are glad to feature a different kind of piece on our blog: Alan West-Durán’s passionate and informative essay about musical bridges between Cuba, the U.S. and Africa. We include links to the music of Chucho Valdés and Gonzalo Rubalcaba and hope you’ll enjoy listening and thinking about how music can cross borders in unique and magical ways. A Cuban music lover’s dream? A utopian interlude for pianists? A bit of respite for the Trump weary? How else to describe Chucho Valdés (1941- ) and Gonzalo Rubalcaba (1963- ) playing duos under the rubric of Trance? Two of Cuba’s most accomplished artists dueling on the keyboards: the former leader of Irakere, whose virtuosity always carries the right amount of elegance and sass, with his younger counterpart, known for his less flashy but diamond-like precision and percussive forays. From a Trance concert at Konzertaus, Vienna, March 2018. Photo by Herbert Neubauer. Chucho, born Jesús, was already making a name for himself by the time Gonzalito was born, and despite the age difference there is much they share aside from musical interests. Both are from prominent musical families, Chucho’s father being the great Bebo Valdés (1918-2013), bandleader at the Tropicana for several years. Gonzalito’s grandfather Jacobo Rubalcaba (1895-1960) was a known composer, his father, Guillermo Rubalcaba (1927-2015), was a gifted pianist, and his older brother, Jesús Rubalcaba (1954-2003) recorded one of the most enthralling Latin jazz albums ever, Estoy Aquí (2001). Both are completely at ease in the Afro-Cuban musical traditions (rumba, son, danzón, Yoruba, Congo, Abakuá, Arará), but meld them effortlessly with European classical idioms, jazz, blues, funk, and rock, to create a music that appeals to young and old listeners, crossing national and cultural borders with impressive skill and creativity. Both, in their own way, have built musical bridges between the U.S. Cuba, Africa, and other parts of the world. Chucho was the founder and leader of Irakere in 1973, right in the thick of the quinquenio gris (the gray five years that ended up being almost a decade), a moment of cultural orthodoxy in Cuban culture, where rock and jazz were viewed as dangerous cultural influences from abroad. Chucho and his cohorts were playing “the enemy’s music,” albeit with a definite Cuban swing. And what a swing: a mix of Dizzy Gillepsie, the orishas, Ignacio Piñeiro, blues, R & B, and funk. In a documentary on Irakere, Chucho even says that the group were the forerunners of timba as well. Just a cursory look at some of Irakere’s members reminds us that the group was a kind of musical matrix of excellence: from Arturo Sandoval and Paquito D’Rivera to José Luis Cortés (El Tosco) and César López. It’s hard to imagine where Cuban music would be without Irakere. Even musicians who were not part of Irakere owe their subsequent careers to the group’s pathbreaking work. Since my focus is on Cuban pianists, one cannot overlook the amazing abundance of world-class Cuban pianists—over twenty—who can play jazz, classical and just about any other kind of music. Aside from Chucho and Gonzalito, the older group might include Hilario Durán, and José María Vitier, and the younger cohort David Virelles, Manuel Valera, and Harold López-Nussa. They constitute a body of work upwards of two hundred recordings that is nothing less than astonishing. The first album I heard by Gonzalo Rubalcaba was Mi Gran Pasión (1988). The entire album revolves around the danzón, combining jazz and classical idioms with a Cuban danzón rhythm that was absolutely gorgeous. The first three tunes “Recordando a Tchaikowsky,” “Mi gran pasión,” and “Concierto en Varsovia” are simply thrilling, each in their own way. The album’s lush beauty and catchy rhythms, however, set me up for a kind of disappointment. Rubalcaba’s subsequent work Discovery (1990) and The Blessing (1991) were very different, much more centered on post-bebop jazz, but somehow I yearned for the more obvious “Cuban elements” of the compositions. In hindsight, I realized that Gonzalito was establishing his credentials as a jazz musician in the U.S., and there is no doubt he did that brilliantly. Gonzalito has played with the likes of Joe Lovano (Flying Colors, 1997), to Jack de Johnette. He had a special relationship with bassist Charlie Haden (1937-2014), with whom he recorded several albums. In 2016, Gonzalito recorded a tribute to Haden, Charlie, where six of the nine songs are Haden’s. The one case where he and Chucho collaborated openly was for the film “Playing Lecuona,” which featured them along with Michel Camilo (a CD of the soundtrack was released). Gonzalito has recorded many U.S. composers, from the standards of the American song book by the likes of Rodgers and Hart, Irving Berlin, and Jerome Kern, to jazz greats such as Duke Ellington, Juan Tizol, Charlie Parker, Todd Dameron, Dizzy Gillespie, and Charles Mingus, among many others. Surprisingly for a jazz pianist, he has only recorded a couple of Monk tunes, usually the composer many post-bop pianists cut their teeth on. Charlie Haden is central to that bridge that Rubalcaba was building between the jazz cultures of the Americas. No doubt, he was nourished by the dialogue of the 1940s started by Dizzy Gillespie, Mario Bauzá, Machito, Chano Pozo, and Chico O’Farrill and embraced by Chucho Valdés and Irakere. But Haden was an invaluable link to the jazz avant-garde of the 1960s, a significant influence in Rubalcaba’s oeuvre. He was a member of Ornette Coleman’s band, and recorded at least nine albums with Ornette, including the Shape of Jazz to Come (1959) and Free Jazz. (1961). Haden also played with Paul Bley, an adventuresome pianist, and together with Bley’s ex-wife Carla Bley, they formed the Liberation Music Orchestra (LMO) in 1969, a group that made several important recordings over several decades. With the LMO Haden penned some of his signature pieces like “Song for Che,” “Sandino,” “La Pasionaria,” “Song of the United Front,” and “Rabo de Nube” (based on the Silvio Rodríguez tune). Haden’s left-wing politics did not turn off Rubalcaba, who has shied away from political statements of any kind, and yet Rubalcaba’s Charlie album features “Sandino” and “La Pasionaria.” Rubalcaba has resonated with Haden’s spirituality (even though he did not profess a specific religious orientation), humility, and passion for justice, not to mention his outstanding skills as a bassist and composer. Ethan Iverson, pianist of the Bad Plus, has said that Haden’s “combination of folk-song, avant-garde sensibility and Bach-like classical harmony is a stream in this music just as distinctive as Thelonius Monk or Elvin Jones.” One could argue similarly for the work of Rubalcaba, adding that he also builds on a Cuban tradition that stretches from Saumell and Cervantes through Lecuona and Roig as well as Chucho Valdés, not to mention Bud Powell, Bill Evans, and Monk. One of Rubalcaba’s most fruitful collaborations with Haden was Nocturne (2001), which won Gonzalito a Grammy as producer and Haden for Best Latin Jazz Album. Unabashedly romantic and lush without ever being schmaltzy, it includes an enviable line-up of top musicians. Most of the compositions are Cuban or Mexican boleros, with two pieces by Haden, and one by Rubalcaba (“Transparence”). Haden and Rubalcaba met at the Jazz Plaza Festival in 1986, and by then he was already a fan of Cuban music, particularly of Carlos Puebla, Cachao, Leo Brouwer, Silvio Rodríguez, and Pablo Milanés. He was an enthusiast of the Cuban bolero tradition and dreamt of making a recording of these torch songs. It took fifteen years, but the wait was worthwhile: “En la orilla del mundo” and “Claro de luna” are absolute gems, with just the right balance of lyricism, sensuality, and ruefulness. Rubalcaba and Haden are superb, but never overshadow the beautiful violin and sax work by Britos, Lovano, and Sánchez respectively. Gonzalito’s album before the homage to Haden (Charlie) was Suite Caminos (2015), an absolutely mesmerizing album. The recording is heavily imbued by the Yoruba tradition: the Eggún (the ancestors), the orishas (Elegguá, Yemayá, Olokun, Obbatalá, Yansá/Oyá, San Lázaro/Babalú-Ayé), and the Ibeyi. Rubalcaba combines chanting (with batá and other percussion) with his own piano, but also electronic keyboards and organ. These different textures give the Yoruba chants an unusual sound; the keyboard work is superb. The singing is top notch, featuring Pedrito Martínez and Philbert Arementeros (percussion also). The album is a spiritual and musical journey that both delights and creates a sense of mystery. Chucho and Irakere owe much to the Gillespie-Chano Pozo connection, and, of course, Machito, Chico O’Farrill, and Mario Bauzá. And it was Gillespie, along with Stan Getz and Earl Hines who travelled to Cuba on a jazz cruise and jammed with Irakere in the seventies, which led to them performing at the Newport Jazz Festival and being recorded by Columbia Records. The other bridge that Irakere built, or perhaps re-built, was to Africa since they incorporated the use of the batá and other types of drums, not to mention the use of Yoruba chants into their work, way before it became a popular thing to do. And while they were doing all this, they were also playing music people could dance to, like “Bacalao con pan” and “Rucu rucu a Santa Clara,” the latter written by José Luis Cortés (El Tosco), who would later form NG La Banda. In the last ten years Chucho has made only five recordings (not counting the Lecuona album and film) but three of them have won Grammys (Chucho has six, total), Juntos para siempre (2008), recorded with his father Bebo, and two with his most recent band, the Afro-Cuban Jazz Messengers, Chucho’s Steps (2011) and Tribute to Irakere Live in Marciac (2016). The Tribute to Irakere features only six tunes, including some classic Irakere melodies but now played by the Afro-Cuban Messengers, ten musicians along with some fine vocals by Dreiser Durruthy Bombalé and Yaroldy Abreu Robles (who both double on percussion). Their rendition of “Juana 1600” was spirited and the chanting to the orishas first-rate; the fifth piece begins as straight up funk but then becomes overlaid with a chant to Oggún, building tension to a long percussion solo that is riveting, and ends by returning to the bouncy funk beat it began with. The album concludes with a 17-minute version of “Yansa” (Oyá), which begins with a chant, then goes into intense riffs by the brass sections, followed by solos on sax and piano. Chucho’s solo is at first dissonant and choppy, but quickly shifts into montuno riffs and some of his trademark arpeggios. The last five minutes of the piece features chanting, with the use of the batá drums, and for a couple of minutes there is only voice and batá. Chucho seems to be signaling that the end is a return to the roots: the orishas, the ancestors, is where all of our music began. It is a fitting and heartfelt ending. Chucho’s most recent recording is a collaboration with Arturo O’Farrill (1960- ), Chico’s son and an accomplished pianist and composer. The album is titled Familia Tribute to Bebo and Chico (2017). Most of the tunes are by Bebo, Chico, Arturo and Chucho. There are many memorable compositions, as well as virtuoso playing, including by Jessie Valdés (drums), Leyanis Valdés (piano), two of Chucho’s children; and also by Adam O’Farrill (trumpet), and Zack O’Farill (drums), two of Arturo’s sons. The album features three generations (from grandfathers to grandchildren) in a mix of big band pieces, small group numbers, a duo (Arturo and Chucho) and a pair of piano solos. Hearing Chucho and Gonzalito play duos at the New England Conservatory’s Jordan Hall (February 16, 2018) was breathtaking. 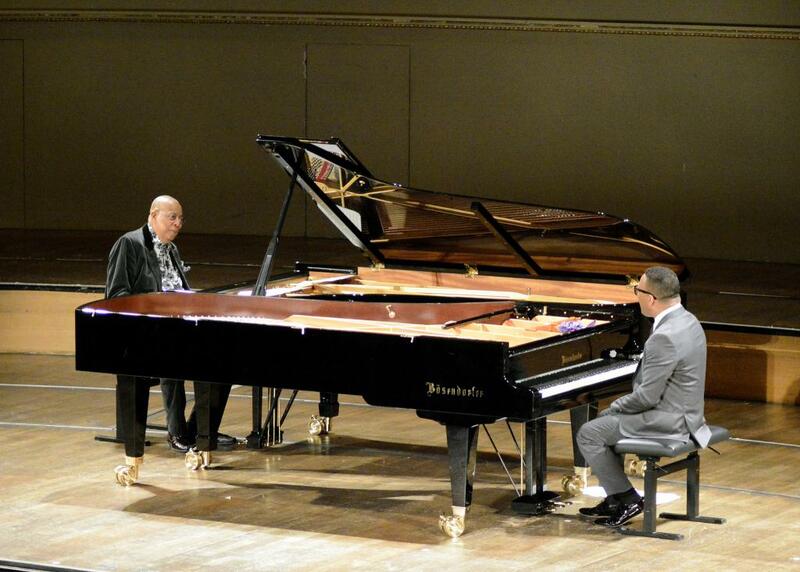 The concert featured some signature tunes: they both played Chucho’s “Mambo influenciado,” a composition that has become a cornerstone of the Cuban pianistic canon. A deceptively simple piece, melodically speaking, but Valdés⏤with varying tempos, switching from hammering chords to tinkling notes, with runs all over the keyboard⏤creates pulsating, shifting rhythms and timbres that are dizzying. It is a magnificent composition and one where he exhibits his absolute virtuosity. This was a piece where Rubalcaba, while adding depth and rhythmic complexity, let Chucho be the star. On another composition “El cadete constitucional,” Rubalcaba, playing a composition by his grandfather Jacobo, was able to shine. Each played a solo piece: Chucho played “Over the Rainbow” with sparkling runs and sudden twists in the melody, executed with his trademark percussive intensity. For an encore they played “Caravan” (Ellington/Juan Tizol), where they egged each other on, trading riffs, ending with rapid bursts. It is remarkable to see how well they play together, because they have vastly different approaches to the keyboard. Chucho is a physically imposing figure with large hands that almost drape the entire keyboard, and they come crashing down in his explosive forays as he moves effortlessly with his left and right hands. One almost expects the piano to creak and moan under such an assault. With Chucho, the piano almost roars like the ocean, Yemayá. Gonzalito is more of a stealth player, his hands darting about with unerring precision, releasing a cluster of notes that delight and surprise. With him, you expect the piano to purr or hum. With Gonzalito, the piano is mellifluous and murmurs like a river, Ochún. But both are master builders of bridges between Cuba, the U.S., Africa, and the world, note by note, chord by chord. Alan West-Durán (Cuba, 1953) is a poet, translator, critic, and essayist. He is the author of two books of poems (Finding Voices in the Rain, 1995 and El tejido de Asterión, 2000) as well as a book of essays Tropics of History: Cuba Imagined (1997). West-Durán edited African Caribbeans: A Reference Guide (2003) and Latino and Latina Writers (2004), which includes over sixty full-length essays on Latino/a authors of the U.S. He is the Editor-in-Chief of the 2011 two-volume reference work titled Cuba. His Cuba: A Cultural History came out in November of 2017. West-Durán is a contributor to the website “Panoramas” and is editor of the webzine “Cuban Counterpoints.” Mr. West-Durán is an Associate Professor of Latin American Studies in the Department of Cultures, Societies, and Global Studies at Northeastern University. He was head of the Latino/a, Latin American and Caribbean Studies program from 2006-2013.